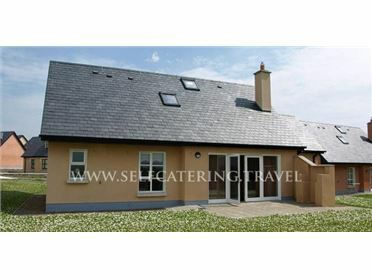 Ard Aoibhinn is a beautiful detached cottage situated in a stunning position overlooking the town of Dungloe, Co. Donegal and can sleep six people. The cottage has two ground floor double bedrooms (one with access to the bathroom), a double with an en-suite shower room, a bathroom, an open plan living area with kitchen, dining area and sitting area with an open fire. Outside there is ample off road parking and a patio garden to the front with furniture. Ard Aoibhinn is a wonderful base for your Irish holiday. Dungloe is known locally as 'The Capital of The Rosses', the name given to this region of the county. The town has a selection of shops, bars and eateries, and events throughout the year, including the annual 'Mary from Dungloe' festival. A fisherman's paradise, the area has over 130 lakes and rivers, and is renowned for its fishing and great sea angling, with several charter boats available in nearby Burtonport. Wonderful wildlife can be found in the bogs and reed beds, while golfers will love the variety of golf courses in the surrounding area. With hills and mountains to explore, dramatic coastline to enjoy and so much to do and see, this is sure to make the perfect base for your Donegal holiday. The West of Ireland conjures up many images; thatched, whitewashed cottages, a flock of sheep on a narrow road, an emerald green field with a stone wall, or the Atlantic waves crashing into towering cliffs and rocky shores..